ACPC MBA, MCA Admission 2019 –The date of entrance exam of CMAT 2019 has been released by National testing agency (NTA). 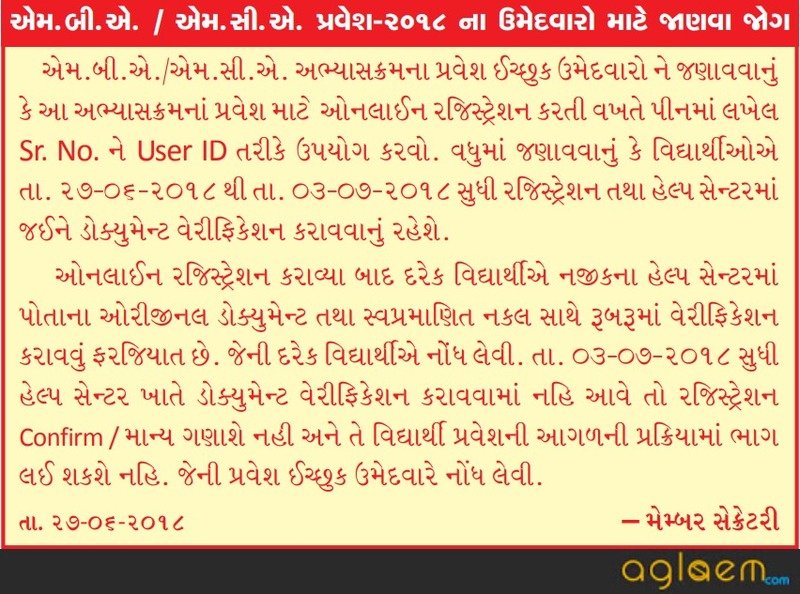 Admission Committee for Professional Courses (ACPC) will release notification from the eligible candidates for admission in the first year of Master of Business Administration (MBA), Master of Computer Application (MCA) and MCA Lateral Entry (Direct Second Year) in Government, Grant-in-aid and Self Financed Institutes in Gujarat State, on State quota of all institutions and management quota surrendered seats of self-financed institutes. Candidates can check the complete information of ACPC MBA, MCA Admission 2019 such as eligibility criteria, admission process etc. through this page below. Latest: The date of entrance exam of CMAT 2019 has been released. scroll down to check. ACPC MBA / MCA Admission 2019 shall be given in all the Government Seats on the basis of merit list prepared by the Admission Committee. All the Management Seats shall be filled by the management of the respective Professional Educational College or Institution, on the basis of inter-se merit list of the candidates whose names appear in the merit list prepared by the Admission Committee based on CMAT 2019. The candidate shall have appeared at CMAT examination 2019 conducted by NTA and shall have passed the qualifying examination (graduation) with minimum 50 % (45 % for SC/ST/SEBC) for MBA, MCA and MCA Lateral. For MCA, the candidate shall also have passed the Higher Secondary School Examination (Standard XII, 10+2 pattern) or Bachelors’ degree with Mathematics or Business Mathematics or Statistics as one of the subjects. For MCA Lateral Entry (Direct Second Year), candidates who have passed the qualifying examination in the stream of Bachelor of Computer Application or Bachelor of Science (IT) or Bachelor of Science (Computer) are only eligible. Candidates whose graduation result is awaited can also apply. However, merit number in such case will be given, if the mark sheet of the passing of qualifying exam is submitted within the scheduled time limit. 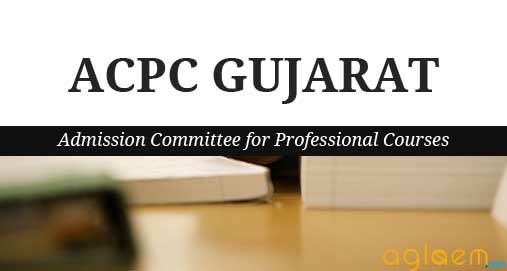 Candidate should visit website www.gujacpc.nic.in or register through the direct link that will be provided below. Candidate should enter his/her CMAT Roll No. of CMAT 2019. Please note that after the due date, the candidate will not be allowed to register online. The candidate who purchases MBC PIN can be registered for both MBA/MCA at the same time. The candidate does not require to register for MBA-MCA course separately. After online registration, the candidate has to submit print-out of the registration form and self-attested photocopies of the required documents at nearby Help Centre and get acknowledgment slip. The candidate has to bring required original documents for the verification. List of designated help centres will also be available on web site www.jacpcldce.ac.in. MBA-MCA link. Documents verification for each and every candidate are necessary. Without document verification, your registration cannot be confirmed/ completed. Apply Online: Application form for ACPC MBA, MCA Admission 2019 will be available on the official website i.e. www.gujacpc.nic.in. Application Form is given below is as per the last year details and is only for the reference purpose.!! The Admission Committee shall prepare merit lists of the eligible candidates who have applied, after verification of the documents submitted. The merit lists shall be displayed on the website of the Admission Committee and by such other means, as the Committee may consider convenient. The Admission Committee shall publish the schedule of online counselling program on its website, by advertisement in the prominent newspapers widely circulated in the State, and by such other means, as it may consider convenient. The candidate shall be required to indicate his order of choices of courses and colleges or institutions, online. Allotment of seats shall be made on the basis of merit, the category of the candidate and availability of seats. The allotment of seats shall be published on the website of the Committee. The candidates are required to obtain the print out of the Information Letter and bank fee receipt copies from the website. The candidate shall be required to pay such fee, as may be determined by the Admission Committee. On payment of tuition fees as required under sub-rule (5), either online payment or in the branches of banks as specified, the admission allotted to the candidate shall get confirmed. The candidate shall be required to log in to his account to get the print out of the Admission Slip. In case, the candidate fails to pay the tuition fees within the prescribed time limit as aforesaid, the admission offered to him shall be treated as cancelled. Such candidate shall not be eligible to get admission on the same course in the same institute in the successive rounds of counselling. Where a considerable number of seats falls vacant and it appears to the Committee to fill up the vacant seats, it may conduct the online admission process for readjustment (reshuffling) of seats. The candidate, who opts to partake in reshuffling process, shall be considered for such admission. The candidate may either give the option for up gradation of choices already given or submit new choices. If the candidate gets the admission on the basis of up-gradation or new choice, then his earlier admission shall be treated as cancelled. All the Management Seats shall be filled by the management of the respective Professional Educational College or Institution, on the basis of inter-se merit list of the candidates whose names appear in the merit list prepared by the Admission Committee. The Admission Committee shall guide, supervise and control the entire process of admission of candidates to the first year of the Master of Business Administration (MBA) Course in the Professional Educational Colleges or Institutions. Applications are invited from the wards of J& K migrants as per the provisions of the government of Gujarat education department. 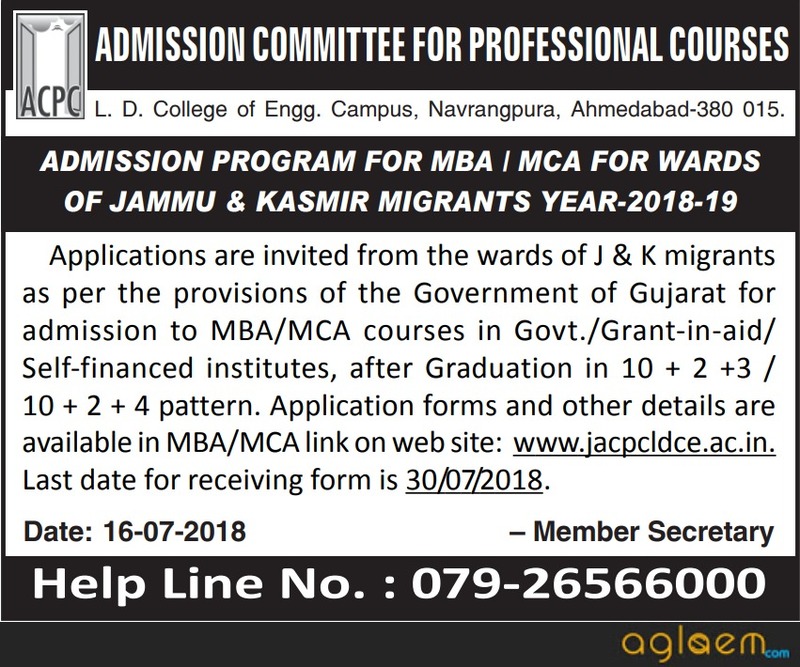 Candidates are advised to check the complete information regarding admission for J &K Migrants advertisement from below. The information given below is as per the last year details and may be subjected to change!! Click here to check the Important instruction for J & K MBA-MCA admission 2018. Click here to check the Application form 2018 for Jammu Kashmir ( J& K) Migrant Student. Click Here to check the Admission for Jammu Kashmir ( J& K) Migrant Students. Click Here to check the Key Dates for Jammu Kashmir ( J& K) Migrant Students Year 2018-19. Subject wise allotment list will be released by the conducting body after the completion of each counselling round. Candidates will be able to check the same from the direct link that will be provided below. The list can also be downloaded from the official website and it is in pdf Format. The details of seat allotment provided below is of the last year and is for the reference purpose only!! Click Here to check the Student allotment for MCA second Round. Click Here to check the Student allotment for MCA Lateral second Round. Click Here to check the Student allotment for MBA second Round. Click Here to check Institute wise online Filled and Vacant seat in round 2 for MBA. Click Here to check Institute wise online Filled and Vacant seat in round 2 for MCA Lateral. Click Here to check the Student allotment for MCA Lateral first Round. Click Here to check the Student allotment for MCA first Round. Click Here to check the Student allotment for MBA first Round. Click Here to check the Important notice for ACPC. Click Here to check the Student allotment of MCA. Click Here to check the Student allotment of MCA Lateral. Click Here to check Institute wise online Filled and Vacant seat in Mock round for MBA. Click Here to check Institute wise online Filled and Vacant seat in Mock round for MCA Lateral. You can refer the last yer MBA/MCA notice i.e. provided below for ACPC MBA, MCA Admission 2019. For the candidates who have passed the Qualifying Examination from any of the Boards, on the basis of marks obtained in the Common Management Aptitude Test (CMAT). The result of First & Second Round MBA, MCA and MCA Lateral will be uploaded on the official website, Which can also be checked through the direct link that will be provided below. Mock round is a trial process to understand the choice filling process as well as seat allotment process, also to know the possible availability of courses/institute as per the merit of the candidate. Candidates will be able to check Mock round details from the links that will be provided below. List of MBA, MCA and MCA Lateral institutes seat matrix has been published, Candidates can check it from below. The candidate allotment will get automatically cancelled if they do not report in person to the allotted institute as per schedules. Click Here to check the proposed new MBA MCA institutes in 2018. For more details of ACPC MBA, MCA Admission 2019 – Download Information Brochure of 2018 for reference purpose..
Insofar, Only date of CMAT 2019 has been released. Information on this page is as per the last year details and only for the reference purpose. 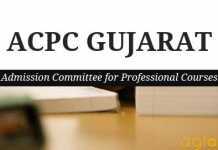 As soon as the ACPC Gujarat release the information regarding ACPC MBA, MCA Admission 2019 the same will be updated here on this page.